Alpha Chi Sigma Gamma chapter is the professional, co-ed chemistry fraternity located at Case Western Reserve University. Alpha Chi Sigma Fraternity, founded December 11, 1902, at the University of Wisconsin, is comprised of a membership limited to upperclassmen majoring in some field of pure or applied chemistry. At first, the only stated qualifications for membership were that the candidate be of high moral character and pursuing a career in a chemical science. Like all fraternities of its day, it assumed that its membership would be white, protestant and male. Wording was soon added to the Bylaws to keep it that way. Times changed, and Alpha Chi Sigma strove to stay ahead of its time. The first restrictions to be removed from the Bylaws came in 1948, making Jewish chemists eligible for membership. All racial restrictions were removed in 1954, well in advance of the race-troubled 60s. Women became eligible for membership in 1971, several years before federal law would have required such changes. Final wording changes were made to the Constitution in 1986, making it clear that once again the only eligibility requirements be that the person be an upperclassman, majoring in a chemistry-related field. Expansion of the fraternity began only a year after its founding, as contacts were made with chemistry students at the University of Minnesota. Beta Chapter, at that university, was chartered in May of 1904, but went inactive almost immediately. The demise of Beta Chapter caused Alpha Chapter to concentrate more on organization and the development of a truly national expansion program. The improved expansion effort proved successful with the addition of Gamma Chapter at Case School of Applied Science in 1906 and Delta Chapter at Missouri in 1907. During 1908, Beta Chapter was reactivated with chapters added at Illinois, Colorado and Nebraska. Alpha Chi Sigma expanded across the country, from M.I.T. to U.C.L.A., from Texas to Montana. The latest chapter to be added to the Fraternity is Gamma Mu, at Northern Arizona University in 1997. Unfortunately not all chapters stood the test of time. For one reason or another, some chapters have gone inactive. 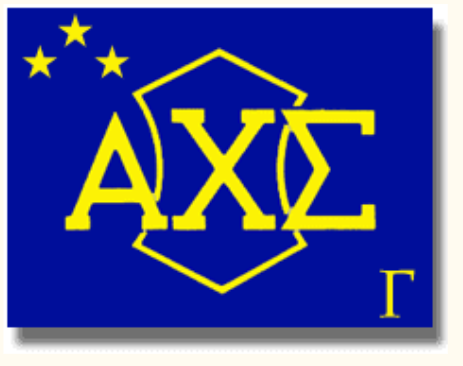 The anti-fraternity sentiment of the late 60s took a toll on all Greek-letter organizations, even professional fraternities like Alpha Chi Sigma. Of the 83 institutions where Alpha Chi Sigma Chapters have been established, 46 are active as of March 1998. As its collegiate members graduated and moved into industry or academia, alumni came together and formed chapters of their own. The Chicago Alumni Chapter was the first such chapter, being formed in 1910. Washington, D. C followed in 1911 and St. Louis in 1913. The alumni chapters caught the attention of the Supreme Council which tried to work out a way to make them a part of the fraternity. At the 1916 Conclave, legislation was passed authorizing the Supreme Council to create Active Alumni Chapters with all the privileges of collegiate chapters, except for the initiation of new members. Early efforts of the Supreme Council in organizing the Alumni Chapters were not well received by the alumni, with several misunderstandings and many hard feelings. Eight of the Alumni Chapters, determined to resolve the problem, sent representatives to the 1922 Conclave. These representatives met apart from the regular Conclave and worked out the details of integrating the alumni with the rest of the Fraternity. Their recommendations created two branches of the fraternity, the Collegiate Branch and the Professional Branch. Each branch was to have a vice president dedicated to their own interests. The reorganization of the Supreme Council created the offices of Grand Professional Alchemist and Grand Collegiate Alchemist while eliminating the offices of Grand Vice Master Alchemist and Grand Alumnus. For a period of time, the Professional Branch flourished. By 1941, there were 25 active Professional Chapters compared to 46 Collegiate Chapters. During the late 60s and early 70s the Professional Branch began to decline to a point where in 1984 only six Professional Chapters were represented at Conclave. In order to restore Professional Branch representation in the Grand Chapter and to stimulate interest among the Alumni, the 1984 Conclave established the office of Professional Representative. Professional Representatives are at-large representatives, elected to two-year terms by the Professional Branch. The number of Professional Representatives is limited to 20% of the number of active Collegiate Chapters. As part of its charge to advance chemistry as a science and as a profession, Alpha Chi Sigma took on a leadership role in the recognition of chemistry-related achievements. The American Chemical Society's Award in Pure Chemistry was established in 1931, but was about to be dropped in 1940 due to a lack of sponsorship. Upon hearing this, Alpha Chi Sigma took sponsorship of the award and has maintained it ever since. To go along with the ACS award, in 1965 the Supreme Council began negotiations with the American Institute of Chemical Engineers to create the Alpha Chi Sigma Award in Chemical Engineering Research. Both these awards are currently funded by the Alpha Chi Sigma Educational Foundation, a non-profit, charitable organization, independent of Alpha Chi Sigma Fraternity. The Educational Foundation began as a device for the Los Angles Professional Chapter to solicit tax-exempt donations to fund their awards program. In 1958, the Foundation was incorporated in the state of California for just that purpose. Later the Foundation was expanded to cover more of the fraternity's awards programs. At the same time, the fraternity sought and received tax-exempt status, making contribution to both the Fraternity and the Foundation tax deductible. Now, as Alpha Chi Sigma approaches its second century, it remains the nation's only professional chemistry fraternity. Its goals and ideals remain virtually unchanged, but its makeup and methods are still undergoing transmutation.